This is a new printing of the original music on sturdy, acid-free paper. 16 pages. Highest quality guaranteed. Size of music is 10.5" x 13.5". $10.00. Cutler’s duet was published in Boston in 1855 and was based on a famous melody by Samuel Webbe (1740—1816). Consolator (sometimes called Consolation) was originally published in A Collections of Motetts or Antiphons from 1792. 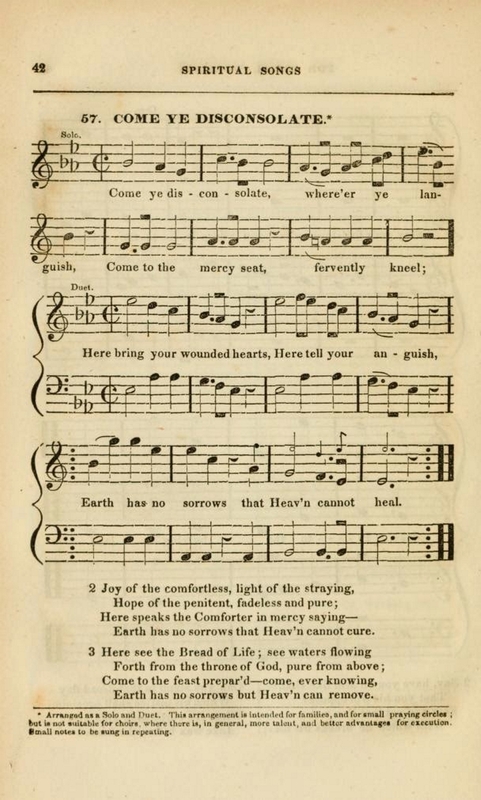 The tune was published with “Come, ye disconsolate” as Number 57 in Spiritual Songs for Social Worship, printed in 1831. The original text from 1816 was written by Thomas Moore (1779–1852) and altered by Thomas Hastings for inclusion in his collection from 1831. You may view the original page here. Henry Stephen Cutler (1824-1902) was known for serving in New York City churches and especially for bringing the idea of using men and boys and choir vestments to this country. He had seen the effects of The Oxford Movement in England while visiting there and worked to share this with American churches. Moderately easy.